On Sunday when NASCAR drivers with whom he regularly traded paint for 15 seasons will be starting engines in Phoenix, Casey Mears wil be eating dirt in the Mint 400. It was only three weeks ago that Casey Mears put a car without a guaranteed starting spot and sponsors into the Daytona 500. In this day and age, that isn’t easy. On Sunday, when the NASCAR drivers with whom he traded paint for 15 seasons will be starting engines in Phoenix, Mears will be eating dirt in the Mint 400. 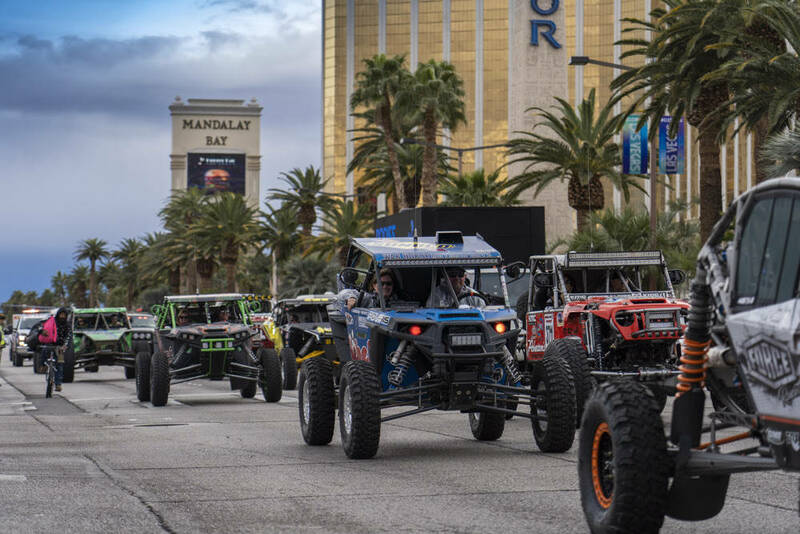 The iconic off-road races — there are four over two days this year — start at Primm behind Buffalo Bill’s and meander for hours through the kind of terrain that would give a camel the dry heaves. Auto racing is like a box of lug nuts. You never know what you’re going to get. Take Casey Mears. The third generation driver, part of the sport’s famous Mears Gang which originally made its name in off-road racing, drove in 489 Cup Series races. He won just once, but that’s more than most guys win. The race Mears won was no ordinary Sunday drive. While making left-hand turns for car owner Rick Hendrick, he finished first at the 2007 enduro known as the Coca-Cola 600 — NASCAR’s longest race, and one of its marquee events. But having turned 40 and lost his full-time ride in Germain Racing’s No. 13 Chevrolet to Ty Dillon, Mears’ NASCAR career may be nearing its end. He finished last at Daytona after being eliminated in a crash just past half-distance in what may have been has last Cup Series race. Are there regrets he didn’t become an auto racing superstar like his Uncle Rick, who won the Indianapolis 500 a record-tying four times. Not really, Mears said. In addition to his stint with Hendrick, Mears also drove for Chip Ganassi in NASCAR and teamed with four-time IndyCar champion Scott Dixon and two-time Indy 500 winner Dan Wheldon to win the 2006 Rolex 24 Hours of Daytona for Ganassi. He also drove in a handful of IndyCar races, finishing fourth as a 22-year-old rookie driving for Bobby Rahal at Fontana, California, in 2000. And, he said, don’t forget when he and Las Vegan Brendan Gaughan were teammates in stadium off-road Superlites. On Sunday, it’ll lead him to the starting line behind Buffalo Bill’s where he will drive the Jean Machine — the truck is owned by Dennis Jean — in the 6100 class. Though it will be Mears’ first desert start, he’s not anticipating the awakening to be rude. “I’ve talked to my dad, talked to my uncle,” he said of Roger Mears, who won dozens of off-road championships and had moderate success as an IndyCar driver; and Rick Mears, who won the Mint 400 in 1975 and was as good as it gets at the Indy 500. Roger’s classic Mint 400 Jeep Honcho was paraded down the Strip with the race vehicles on Wednesday. It’s also a race to which somebody named Mears should quickly adapt. Some guys have ice water coursing through their veins. The Mears Gang has desert dirt. He was reminded about what his Uncle Rick famously said, that “to finish first, you must first finish.” It was an axiom developed in the desert and honed to perfection at Indianapolis. But Mears said another little gem of advice courtesy of his famous racing uncle may better apply to his race. “Talking to Rick, he said ‘I always treated every bush like it was a rock, because not every bush has a rock behind it — but some of them do,’” Casey Mears said.